I received a copy of this collection of short stories after Book Lush hosted a giveaway of sorts (literally she just gave a huge stack of her books away to make room on her self - no tweets or signing up required, which is my kind of giveaway.) I had been hoping to get my hands on a collection of stories by Van Booy for awhile, so I was super excited to see it was available on her list of giveaway books. I'm normally not a huge fan of short stories, as I tend to gravitate and enjoy longer narrative works, but I like to sprinkle them into my reading diet nonetheless. 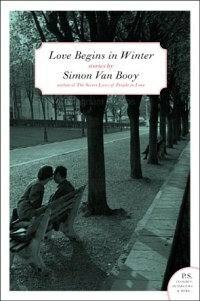 Unfortunately, Love Beings in Winter was not a collection that ultimately satisfied me. While there were instances of fascination and curiosity, the majority of the stories fell flat for me. Each character seemed a little too delicate and many instances too exaggerated to enjoy the meaning of the story at hand. This isn't to say that I didn't enjoy any of the stories in the collection. 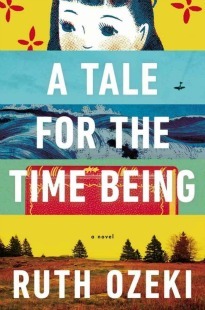 There was one story that I found utterly charming, and there were passages in each story that were notable; I found myself underlining more lines in this book than I do in most. It should be said that Van Booy certainly isn't lacking in ideas and he manages to convey those ideas with eloquent and sobering prose. Children are the closest we are to wisdom, and they become adults the moment that final drop of everything mysterious is strained from them. I think it happens quietly to every one of us -- like crossing a state line when you're asleep. But in a collection of five stories, enjoying only one just seems like it misses the mark. I can say that while I didn't abhor this book, I don't think it will stay with me for very long. I probably won't be seeking out Van Booy's other collection of short stories anytime soon, though I do love the title The Secret Lives of People in Love. However, I would be willing to give his novel, Everything Beautiful Began After, a try. Aww, bummer that it wasn't great. Love the title though! I did enjoy The Secret Lives of People in Love and Everything Beautiful Began after. Seems like this collection differs from Secret Lives because the stories are longer. There was a mixture of lengthy ones and very very short stories in Secret Lives. Maybe his style lends itself to the shorter the better. Looking forward to trying this one myself to see where my opinion falls in line. I have a Van Booey collection from Net Galley that looked intriguing. I am sorry to hear you didn't like this one more. Short story collections can be a little hit or miss for me. Everything Beautiful Began After is intense! I've learned that I have a hard time with most short story collections. There are only a few authors that can really make me feel invested in that format. I wasn't thrilled with this one either, but I passed it on to a coworker who loves short stories, so hopefully she'll like it better than I did! Hi! I'm a new follower and I wanted to tell you that I love your blog! I gave you a Kreativ Blogger award on my site! I was curious about this one. I have his newest book, but haven't read this one. Too bad only one story worked for you.